According to SNL alum, one of the questions Lorne Michaels asks you when you’re auditioning is which cast of the show did you grow up on. Who were your guys? Mine was the Will Ferrell/Cheri Oteri/Norm Macdonald cast, so he was my guy for Weekend Update and it became obvious very quickly that either you got Norm Macdonald or you didn’t. On the one hand, he never became a superstar like Molly Shannon or Adam Sandler (I can’t really imagine him as a comedy superstar) and almost seemed to leave the spotlight for a while. Was it uncool to like Norm? On the other hand, I’d see him on Conan and Letterman. Cynical as he is, Conan would always have an appreciation for the man and his humor, and his appearances on the Tonight show rank among my favorites. And when he was on Letterman? I never saw him laugh to fully along with a show guest. If you made Letterman laugh, you were cool in my book. It’s easy to label Norm as an old-fashioned or even “comedian’s comedian,” because you either get it or you don’t. Or more accurately: Norm’s either your style or he isn’t. And that’s fine. His humor is a lot more toned down and modest than the comedy that’s become the standard in the current comedy boom. It’s also much zanier than it gets credit for. Norm is a lot less interested in saying things just to get applause and more into making his personal observations. As a Norm fan, this Netflix special Hitler’s Dog, Gossip and Trickery is just where I want him: in his comfort zone. It’s really a great representation of what the man does, and what he can do when he’s at the top of his game. You could say his comedy stylings haven’t changed a bit, but that would be a good thing. In a world of comedians who are desperate for wokeness and trying to be bigger than they actually are, it’s actually the old-fashioned ones like Norm who are a breath of fresh air. Ironic isn’t it? What’s old, always becomes new again. Strange and cool to have this release out on vinyl, but for music and comedy album collector’s this is a god-sent. 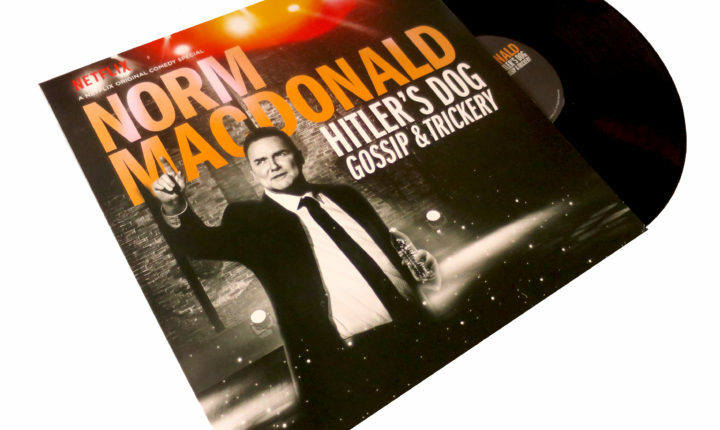 Norm will never be the most popular or the hippest comedian around, so to give him the vinyl treatment feels almost like a once in a lifetime thing. The package is pain and simple: just the records in a plain sleeve. Just like Norm. But, I gotta say, that cover is pretty sweet. Norm hasn’t looked or sounded this good in a long time.